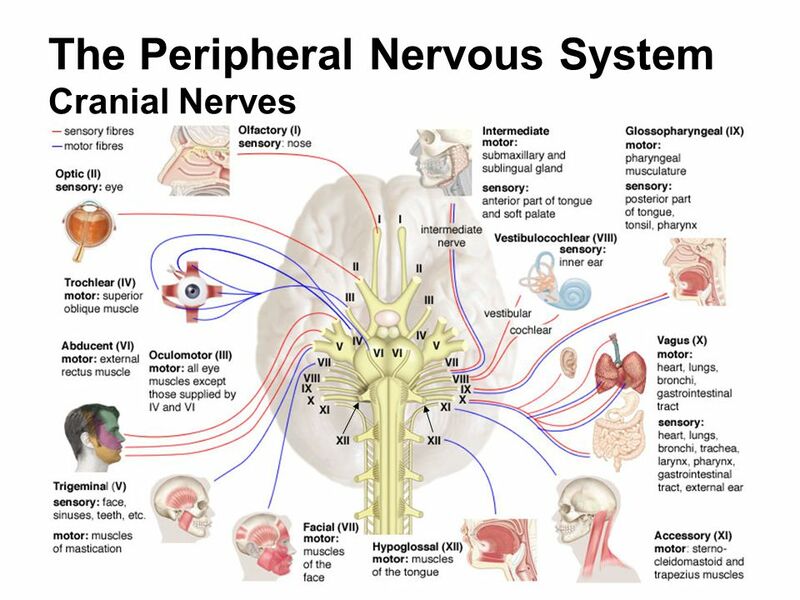 The peripheral nervous system (PNS) consists of cranial and spinal nerves that connect the CNS to other portions of the body, along with sensory receptors and ganglia. A nerve consists of axons that are bound together by connective tissue. Motor nerves contain mostly axons of motor neurons; sensory nerves contain only axons of sensory neurons; and mixed nerves contain both motor axons and sensory axons. Most nerves are mixed. Nerves may contain axons of both the somatic nervous system, which is involved with voluntary responses, and the autonomic nervous system, which controls involuntary (automatic) responses. Twelve pairs of cranial nerves arise from the brain and connect the brain with organs and tissues that are primarily located in the head and neck. Most cranial nerves arise from the brainstem. Cranial nerves are identified by both roman numerals and names. The numerals indicate the order in which the nerves arise from the inferior surface of the brain: CN I is most anterior; CN XII is most posterior. Five cranial nerves are primarily motor, three are sensory, and four are mixed. CN I Olfactory Sensory Transmits sensory nerve impulses from olfactory receptors in olfactory epithelium to the brain. CN II Optic Sensory Transmits sensory nerve impulses for vision from the retina of the eye to the brain. CN III Oculomotor Motor Transmits motor nerve impulses to muscles that move the eyes superiorly, inferiorly, and medially; control the eyelids; adjust pupil size; and control the shape of the lens. CN IV Trochlear Motor Transmits motor nerve impulses to muscles that rotate the eyes. CN V Trigeminal Mixed Transmits sensory nerve impulses from scalp, forehead, face, teeth, and gums to the brain. Transmits motor nerve impulses to chewing muscles and muscles in floor of mouth. CN VI Abducens Motor Transmits motor nerve impulses to muscles that move the eyes laterally. CN VII Facial Mixed Transmits sensory nerve impulses from the anterior part of the tongue to the brain. Transmits motor nerve impulses to facial muscles, salivary glands, and tear glands. CN VIII Vestibulocochlear Sensory Transmits sensory nerve impulses from the internal ear associated with hearing and equilibrium. CN IX Glossopharyngeal Mixed Transmits sensory nerve impulses from posterior portion of the tongue, tonsils, pharynx, and carotid arteries to the brain. Transmits motor nerve impulses to salivary glands and pharyngeal muscles used in swallowing. CN X Vagus Mixed Transmits sensory nerve impulses from thoracic and abdominal organs, esophagus, larynx, and pharynx to the brain. Transmits motor nerve impulses to these organs and to muscles of speech and swallowing. CN XI Accessory Motor Transmits motor nerve impulses to muscles of the palate, pharynx, and larynx and to the trapezius and sternocleidomastoid muscles. CN XII Hypoglossal Motor Transmits motor nerve impulses to the muscles of the tongue. Arising from the spinal cord, there are thirty-one pairs of mixed nerves called spinal nerves. Each pair of spinal nerves is named based upon where it exits the vertebral column. The first pair of spinal nerves emerges from the spinal cord between the atlas and the occipital bone. The remaining thirty pairs of spinal nerves emerge through the intervertebral foramina between adjacent vertebrae, the sacral foramina, and the sacral hiatus. There are eight pairs of cervical nerves (C1-C8), twelve pairs of thoracic nerves (T1-T12), five pairs of lumbar nerves (L1-L5), five pairs of sacral nerves (S1-S5), and one pair of coccygeal nerves (Co). There are seven cervical vertebrae. Because the first pair of spinal nerves emerges superior to the atlas, there are eight pairs of cervical nerves instead of seven. Spinal nerves branch from the spinal cord by two short roots that merge a short distance from the spinal cord to form a spinal nerve. The anterior root contains axons of motor neurons whose cell bodies are located within the spinal cord. These neurons carry motor nerve impulses from the spinal cord to effectors. The posterior root contains axons of sensory neurons. The swollen region in a posterior root is a posterior root ganglion, which contains cell bodies of sensory neurons. The long axons of these neurons carry sensory nerve impulses to the spinal cord. The spinal cord ends at the second lumbar vertebra. The roots of lumbar, sacral, and coccygeal spinal nerves continue inferiorly within the vertebral canal to exit between the appropriate vertebrae. These roots form the cauda equina, or horse’s tail, in the inferior portion of the vertebral canal. After a spinal nerve exits the vertebral canal, it divides into four major parts: the anterior ramus (plural, rami), posterior ramus, meningeal branch, and ramus communicans. The posterior ramus innervates the deep muscles and skin of the posterior trunk. The meningeal branch innervates the vertebrae, meninges, and vertebral ligaments. The ramus communicans passes to the sympathetic chain ganglia and is part of the autonomic system. The anterior rami of many spinal nerves merge to form spinal plexuses, networks of nerves, before continuing to the innervated structures. The anterior rami of most thoracic nerves do not form plexuses; rather, they form intercostal nerves. The intercostal nerves innervate the intercostal and abdominal muscles, in addition to overlying skin. In a plexus, the axons in the anterior rami are sorted and recombined so that axons going to a specific body part are carried in the same peripheral nerve, although they may originate in several different spinal nerves. There are four pairs of plexuses: cervical, brachial, lumbar, and sacral. Because many axons from the lumbar plexus contribute to the sacral plexus, these two plexuses are sometimes called the lumbosacral plexus. The superior cervical nerves merge to form a cervical plexus on each side of the neck. The nerves from these plexuses supply the muscles and skin of the neck and portions of the head and shoulders. The paired phrenic (fren ‘-ik) nerves, which stimulate the diaphragm to contract and begin inspiration, also arise from the cervical plexus. The inferior cervical nerves and perhaps nerves T1-T2 join to form a brachial plexus on each side of the vertebral column in the shoulder region. Nerves that serve skin and muscles of the pectoral girdle and upper limb emerge from the brachial plexuses. The musculocutaneous, axillary, radial, median, and ulnar nerves arise here. The last thoracic nerve (T12) and the superior lumbar nerves unite to form a l umbar plexus on each side of the vertebral column just superior to the coxal bones. Nerves from the lumbar plexuses supply the skin and muscles of the inferior trunk, external genitalia, and the anterior and medial thighs. The femoral and obturator nerves arise here. The inferior lumbar nerves and the sacral nerves merge to form a sacral plexus on each side of the sacrum within the pelvis. Nerves from the sacral plexuses supply the skin and muscles of the buttocks and lower limbs. The sciatic nerves, which emerge from the sacral plexuses, are the largest nerves in the body. Reflexes are rapid, involuntary, and predictable responses to internal and external stimuli. Reflexes maintain homeostasis and enhance chances of survival. A reflex involves either the brain or the spinal cord, a sensory receptor, sensory and motor neurons, and an effector. Most pathways of nerve impulse transmission within the nervous system are complex and involve many neurons. In contrast, reflexes require few neurons in their pathways and therefore produce very rapid responses to stimuli. Reflex pathways are called reflex arcs. Reflexes are divided into two types-autonomic and somatic-based on the effector(s) involved in the reflex. Autonomic reflexes act on smooth muscle, cardiac muscle, adipose tissue, and glands. They are involved in controlling homeostatic processes such as heart rate, blood pressure, and digestion. Autonomic reflexes maintain homeostasis and normal body functions at the unconscious level, which frees the mind to deal with those actions that require conscious decisions. Somatic reflexes act on skeletal muscles. They enable quick movements such as moving the hand away from a painful stimulus. A person is usually unaware of autonomic reflexes but is aware of somatic reflexes. Reflexes are also divided into cranial reflexes and spinal reflexes, depending upon whether the brain or the spinal cord is involved in the reflex. A somatic spinal reflex, which withdraws the hand after sticking a finger with a tack. Three neurons are involved in this reflex. Pain receptors are stimulated by the sharp pin and form nerve impulses that are carried by a sensory neuron to an interneuron in the spinal cord. Nerve impulses pass along the interneuron to a motor neuron, which carries the nerve impulses to a muscle that contracts to move the hand. Although the brain is not involved in this reflex, it does receive sensory nerve impulses that make a person aware of a painful stimulus.